We are roughly 2 hours from the George Washington Bridge in NYC. Please note that summer traffic exiting nyc on Fridays can be severe. From New York City or Albany: New York Thruway to exit 19. Take Route 28 west towards Pine Hill. At Route 212 (a few miles after driving through Boiceville), turn right. At the first intersection, turn left on South Plank Rd. Pass the Zen Monastery and continue 1 mile down the road. 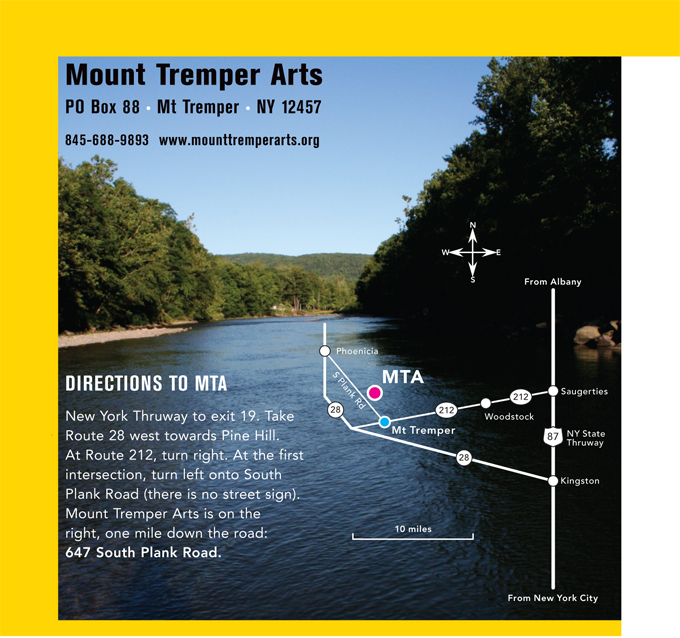 Mount Tremper Arts is on the right. Directions From Phoenicia: Heading east from Phoenicia, Main Street turns into Old Plank Road. Continue on this road past the trailhead, past Mountain Laurel Road and past Uncle Pete’s Campground. Our driveway (#647) is on the left just after a hidden driveway sign. If you get to Zen Mountain Monastery, you’ve gone too far. From Woodstock: Take 212 heading west. In Mt. Tremper, go past Catskill Rose and then at the stop sign, turn right onto Plank Rd. Go 1 mile (past the Zen Monastery) we are on the right, #647.